Q. The image on my prints is flawed, what is causing it? A. Generally dry process printing can be broken down into image formation and image fixing. Image formation takes place near where the printing starts and fixing is toward the end of the path. Stopping the paper between the two processes can help identify where the issue is occurring. From the manual feed tray print a busy page and as the tail of the page starts to enter the machine, open the toner door and remove the toner cartridge. Look at the image on the paper in the machine. Be careful, the toner is still loose at this point. If the image is good, call for service, if the image is no good, replace the toner and/or drum. Q. My printer is making a grinding noise, should I be concerned? A. Yes. Call for service immediately. In many cases if the cause of the noise can be addressed early on it is much less expensive to resolve than if you wait until the noise gets loud. Q. The printer says that it has a jam be we cannot find anything in the machine. What should we do? A. We lovingly refer to these as “no-see-’em’s”. Generally, this is caused by a shard of paper or the like where it can’t be seen or a stuck sensor. Take a small, thin (“floppy”) ruler, remove the paper tray nearest the print engine and the toner cartridge then use the ruler to “floss” the paper path by pushing it up through the paper path into the cavity of the printer working your way from one side to the other. Also, if you have duplex or two-sided ability, either open the duplex pan or power down the printer and remove the duplexer and look for paper. Still no luck, call for service. Q. How can I tell how much toner is in the cartridge? A. On HP printers, most cartridges contain the toner and the drum. Generally the handle side of the cartridge is the toner fill and the other end is the waste toner. Holding the cartridge by the waste end, tap the fill side with your finger nails or something hard and listen. If is sounds solid, you have toner, if sounds real hollow, you don’t have much toner (if any). Oh, and ignore the “Toner Low” message on most dry process machines, this is based on the number of pages that have been printed and has nothing to do with how much toner you have in the cartridge. Q. There is loose toner in the cavity of my printer, should I blow it out with compressed air? A. NEVER! Toner is very light and the particles are very small. Compressed air gets the toner airborne and it can get in the optics causing the laser to defract or even be blocked. If you see toner in the cavity use a toner cloth (ITWorkz will give you one) to wipe it out. Avoid touching the transfer roller (the long flat black roller that sits under toner cartridge with your fingers or hand. The oil can block the static charge that the roller transfers to the paper causing a degradation in the image. Also be careful around small belts and rollers inside in that these can get dislodged resulting in a service call. Q. The printer says “Load Plain Letter In Tray “X”, what’s wrong? A. There are two possibilities here. First, the printer may think that the tray has a paper size other than letter in it. In most HP medium to large printers, the paper size is communicated to the printer by the settings in the tray. If the length or width are not set to 8 1/2 x 11 the printer thinks that something other than letter size is in the tray. Check the paper width and length adjustments. On the LaserJet 4000 and 42×0 and 43×0 machines the paper length adjuster has a tendency to fail. You do not need a new tray, the adjusters are not expensive to replace. Width adjuster do not generally fail but are occasionally moved by “gremlins”. As for “Plain”, this is the paper type. This is set on the printer under the Paper Handling menu. Print a configuration page and look at the lower right side of the page. The tray settings should be described there. If they don’t match what you are trying to do the machine will ask you to load the appropriate paper. Q. When printing envelopes with my LaserJet 5Si, 8000, 8100 or 8150 they come out curled and wrinkled, is there a way to avoid that problem? A. Sure. First, envelopes should be loaded in Tray 1 or the Envelope Feeder and should come out to the face up tray. Second, open the left side door and look at the fuser. On either side of the fuser, just below the locking handles are levers with the internationally misunderstood symbol for envelope. They should be in the down position. When you are going to print envelopes, put the levers in the up position. This opens the gap in the fuser reducing the pressure and avoiding the creasing. Be sure to put the levers back down when you are done printing envelopes because the up position can cause jams when printing plain paper. Q. When I printer envelopes, the toner flakes off, what’s wrong? A. For toner to properly adhere to the stock it has to be heated all the way through. Envelopes are much thicker than plain paper. Under the Paper Handling menu, check the paper type for the tray you are using. If you are printing envelopes from tray 1, set the paper type for tray 1 to envelope. Q. My LaserJet 42×0 etc. seems to be printing slow, what’s the matter? A. Many of these machines have a switch in the tray marked “Standard” and “Custom”, it’s on the right side toward the back of the rail. If this switch is in the Custom position the printer runs at half speed. If you aren’t running a custom stock, the switch should be in the standard position. Q. The LaserJet 42×0, 43×0 is making a strange noise that seems to be getting louder over time. Is this a problem? A. Yes. The sooner you address it, the cheaper it is to fix. The gear that drives the fuser can begin to fail and when it does it starts with a noise that gets louder and finally you will start getting jams at the fuser. Don’t wait to get this unit serviced. If caught early, it’s an easy fix, if you wait, it costs a lot more. Q. My LaserJet 24×0 or P3005 is making a grinding/clicking noise and gets jams at the fuser, is there a way to fix that? A. You bet. That engine can have one or both issues that are common. The fusing assembly has plastic bushings that can wear through causing the fuser to bind. Those busings can be replaced (much cheaper than replacing the fuser). The other issue is the gears that drive the fuser can wear causing the unit to be noisy and making it bind up. These too can be replaced. Again, earlier is better. Q. Our LaserJet 5Si, 8000, 8100 or 8150 feeds fine from tray 2 but jams from tray 3. The jam can be found in the lower right door on the machine. What’s wrong? A. Sounds like you have a bad Second Pass Roller. Most shops want to replace your Paper Input Unit (PIU), about 200 bucks. You probably only need a new 2nd Pass Roller (about $45.00). Open the Toner Door and take out the cartridge. Lift the green handle marked “2” and if needed, the silver metal flap underneath it and look at the four rollers underneath. If they are gray and/or shiny, they should be replaced. Q. My LaserJet 4000, 4050, 4100 pulls more than one sheet of paper when printing from tray 1. Should I buy a new printer? A. No. The tray 1 separation pad wears and doesn’t do it’s job. ITWorkz replaces the 4000 and 4050 separation pad with the 4100 style pad that is easy and cheap to replace. The new pad solves the problem. Q. The LaserJet printer display says “PERFORM MAINTENANCE”, is there something wrong with my printer? A. Not yet. The propeller heads at HP have figured out about how many pages the internal parts of their machines work for before they fail. The PM message is based on the number of pages that have been printed since a kit has been installed or the unit was new. It’s actually referred to as a Preventive Maintenance Kit. Install it before something fails. Should you see this message, call ITWorkz and we will install a kit and clear the message. You machine will be good for another several 100,000 pages. Q. My HP LaserJet 4000/4050/4100 gets a jam at the fuser every time I try to print. Is the unit defective? A. No. Yes there is a defect but the machine is generally fine. The pressure roller in the fuser sometimes separates from the shaft that drives it and this causes jams at the fuser. New fuser and your printer runs like new. Q. My Color LaserJet 2500/2550/2820/2840 has print issues. One side of the image is great but the other side is blank. Is it time to put it out to pasture? A. No. These units have what is known as a Carousel. It’s driven by two big gears and can get out of alignment. An experienced tech knows how to adjust the gears without breaking the machine down. If you hire a tech that starts taking the unit apart, stop them and send them on their way. It’s a simple fix that takes less than 5 minutes. Q. My Color LaserJet 3000/3600/3800 keeps showing an error code like 10.92. I just put in a new OEM toner cartridge and it won’t print, what’s wrong? A. Older units have black toner locks that can fail. Take out all of the toner cartridges and looking into the unit on the right side where the cartridges go in and slowly close the front door. You should see four small arms move down, if they are black, your have the old stile toner locks. Call your service provider to have them replaced. Q. Do I need new paper rollers? A. One of the most common causes for mis-picks or jams in printers is worn rollers. Another common symptom is “groaning” or a sound similar to a squeegee on wet glass. That’s the roller slipping on the paper. In most commercial grade printers the rollers are relatively easy to replace and are mostly inexpensive. 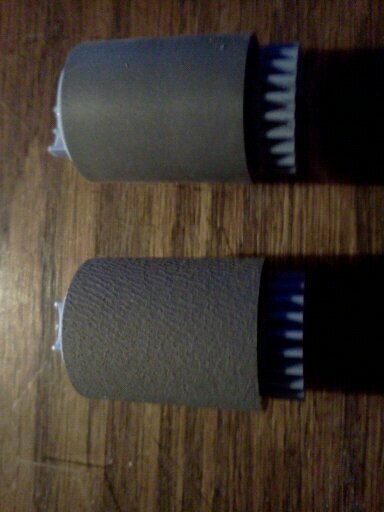 If you don’t know how to change the rollers it’s a good idea to have your service provider show you how to change them. After that you can generally change them yourself saving time and money. If you have several of the same model printer it might be a good idea to ask you service provider for a few extra rollers to keep on hand in a pinch. The photo below shows a common roller used in several machines. The upper roller is worn, the lower is new. Notice that the texture has worn off the upper roller and it has a bit of a shine. Simply remove the old roller and install the new roller making sure that it clicks into place and that any drive teeth or gear ends interlock (common user installed failure). It is important to make sure you are installing the correct roller. As techs we frequently see the wrong roller installed causing the user to request service. If the ends don’t look the same or the core (hard plastic) isn’t about the same color, it’s probably not the right roller. One last thing, discard the old rollers. The plastic cores should be recyclable. Q. My LaserJet printer is making a strange squeaking noise, is there a real problem? A. Maybe, maybe not. First test is easy. Open the toner door, remove the cartridge and close the door. The engine should cycle. Did the squeak go away? Try a new toner. Still squeaking? Print a test page. Listen while the sheet travels through the machine. Does the noise stop at any point? If yes, where does it stop? With this information, call for service and tell your service provider where the noise stops. They can usually have the needed part in hand on the first trip and speed up your service call and reduce the cost. Q. The images on my LaserJet printer have a grey, hazy or striped background. Should I call for service? A. Not yet. Open the toner door and remove the toner cartridge. Turn it over and open the shutter for the imaging drum. Is there a bunch of toner on the drum? Bingo! You have a bum cartridge. You can try sliding a card between the drum and the blade (just use a business card, slip it between the drum and the wiper and slide it back and forth across the unit). If you aren’t sure, try it on both sides. Put the cartridge back in and print several pages. If the problem goes away, problem solved, if not, replace the cartridge. If the problem comes back with the new cartridge call for service. Q. What should I do when my printer says “Perform Maintenance”? A. Most people do not wait until they have a tire failure before they buy new tires. Usually, when they see noticeable wear, they get new tires. Not so with printers. Most printers will display a message asking the user to “Perform Maintenance” that many users simply ignore, until the unit fails. The engineers at the manufacturer estimate the average number of pages a machine can go before it should be serviced. Trust them, it’s their living. When a machine tells you, “perform maintenance” it isn’t kidding. It’s called “Preventive Maintenance”, which means we want to prevent your system from leaving you dead in the water. Instead of waiting for your printer to fail, have the maintenance performed by a trained, qualified technician (yes, you could do it yourself but you may miss something important) using quality parts. A good service company’s goal is to have you up, running and getting your job done. If you have the service performed when the machine says “feed me”, you will avoid costly down time, if not, you may experience a printer out of service for 24 or more hours. We all know the line “Pay me a little now or a lot later”. Many of our clients have us visit their location(s) once or even twice a year to clean an evaluate each of their printers. This provides them with a professional evaluation of their equipment and eliminates most failures at critical times in their business cycle. Yes, having a technician visit your location(s) does cost but having a machine out of service for a day or two costs much more.